The Oregon Single Payer Campaign is no more. This website is obsolete. The Oregon Single Payer Campaign has spearheaded the creation of a new state-wide coalition of diverse organizations and organizing committees working together for a comprehensive, high-quality, publicly-funded health care system that will serve everyone in Oregon and the United States. As part of the transition process, this website will soon be replaced with a new site with complete information about all our plans and activities, as well as updated resources for you to join the grassroots movement that will be necessary if we are to bring about our vision for an equitable and humane system of caring for each other to replace our current dysfunctional market-driven system. We believe health care is a human right. No one should suffer or die because they lack health insurance. We can end this needless fear and pain, this criminal waste of human life. The Oregon Single Payer Campaign has been spearheaded so far by hard-working volunteers, dedicated to the vision of bringing quality, affordable, publicly-funded health care to all Oregon residents. Now that we are organizing formally to make this vision a reality, our new coalition will need a full-time organizer to coordinate local and statewide campaigns.Please become a Sustainer today, helping build a strong organization by making a monthly contribution. We also happily accept one-time donations. We are building a state-wide Single Payer organization! 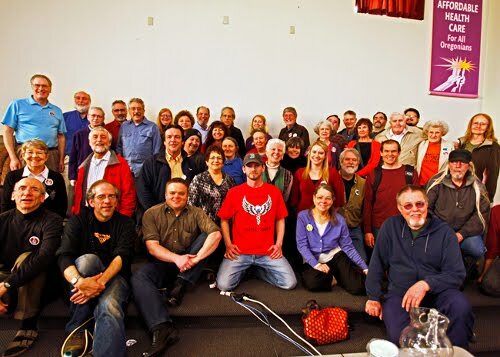 Coalition delegates gathered at the SEIU 503 Hall in Portland on April 13 to formalize the corporate structure, elect officers and directors, and discuss strategies and operational goals. Mike Huntington, M.D, (far left in front row) was elected coalition president. Can We Afford Singlepayer Healthcare? Is the Supreme Court decision upholding the Affordable Care Act good news or bad? It depends on who you are. If you are President Obama, the news is good. The highest court in the land just validated the showpiece legislation of your first years in office. Election prospects just got brighter. If you are Gov. John Kitzhaber or one of the 600,000 Oregonians in the Oregon Health Plan, the news is also good. This decision preserves critically important support from the ACA to the health care transformation process, a dramatic method of health care delivery with potential to provide better care at lower cost for 15 percent of Oregon's population. And if you are a health insurance executive, the news is spectacular. The Supreme Court just confirmed a law requiring every American to purchase your product regardless of price, or face a penalty. Protests on the Supreme Court steps were drowned out by the clinking of whiskey glasses in health insurance boardrooms around the country. For the rest of us, however, it is bad news indeed. Yes, the ACA will dramatically increase the number of insurance policies sold, but it won't make policies cheaper, nor will it make health care more affordable or more accessible. In fact, the ACA will increase health care spending by $400 billion annually. This extra cost will not appear on the federal budget because costs are passed on to us, the patients, via compulsory purchases of insurance, increased premium prices and dramatically increased out-of-pocket spending. Nor will the ACA protect American families from financial and medical catastrophe if one of us gets the wrong disease at the wrong time. Our most vulnerable families still face the unhappy choice of spending their last dollar on their mortgage or on their health care deductible. Every industrialized country in the world provides better care to more people for less money than we do. None use our uniquely American style of private health insurance. Let's get real: If we plan a radical and painful makeover of our disastrous health care system, doesn't it make more sense to emulate these systems that work (using publicly funded universal health care) rather than one that doesn't? And the one system that we absolutely know doesn't work is the one we have now. Unhappily, the ACA is guaranteed to produce one sure-fire result. Americans will become more dependent than ever before on private health insurance for their only access to health care. If you like what private health insurance has inflicted on our society up to now, just wait until you see what the newly approved ACA will do to us in the future. Neither Congress nor the ACA will save us from health care Armageddon. We in Oregon must take charge of our future. It's time to create our own reality-based, cost-effective, publicly funded universal health care system and say tell the Supreme Court and ACA to take a hike. Samuel Metz is a Portland anesthesiologist and a member of Physicians for a National Health Program and Mad As Hell Doctors, both advocates for single-payer health care, and of Health Care for All Oregon, an umbrella organization advocating for publicly funded universal care for all Oregonians. Regence BlueCross BlueShield justifies removal of mental health coverage from its individual policies coming up in October, saying that it wants to keep premiums from rising ("Regence pares plan options," May 3). It offers "relief" by increasing the deductible to $2,500. This change would affect around 30,000 members. At the same time, Regence plans to shift 20,000 members' plans to one that restricts their choice of physicians, forcing many of them to change primary care doctors. And the squeeze on hospitals, largely attributable to Regence paying less, is resulting in layoffs of nurses, jeopardizing quality of care and lives. Thirty five nurses lose their jobs. . .
What do all these headlines and ads tell us? Our healthcare system is broken. In order to keep our hospital doors open we must fire nurses and simultaneously do the equivalent of bake sales in our cardiology departments and operating rooms, open a fitness center and an apartment complex. There are more than 50,000 chemicals in our air, water and food, only a tiny percentage of which have been tested for safety. Cancers do not come with tags that say: “I came because you lived next to a gas station as a child”, or “I came from the BPA in the canned soup you ate every day,” or “I came from the pesticides on the fruit you love, or the dry cleaning chemicals you inhaled on your job....” No one can say what infant may have been damaged for life by being bathed daily in hexachlorophene soap recommended by their doctor, or whether a heart attack may have come from Vioxx or from a daily pint of ice cream, or whose poor health may be a result of the styrene and benzene in the styrofoam cups they drink from, or the contaminated honey from Asia they put on their cereal every day. The list is endless. In an industrial society, one faulty decision on the part of a corporation or a government body can hurt hundreds of thousands of people. Therefore, along with the wealth that comes from industrialization, any industrial society must also accept the responsibility to provide health care for its people, if it has any right to be called civilized at all. Human rights are not a luxury concocted by the left. They were central to the Founding Fathers’ vision of America. The Declaration of Independence states that governments exist to secure inalienable rights, which include the rights to “life, liberty and the pursuit of happiness.” It’s past time that we make these rights real, with health care security and freedom for all of our people through a single payer health care plan. Many aspects of the Affordable Care Act, the Supreme Court decision, and well-designed CCOs are causes for celebration. But millions of Americans, their employers, and their governments will continue to be bankrupted and otherwise harmed by our health care system. We have come a long way but we have a long way to go. Join other advocates in an energizing and informative workshop this summer. Learn strategies that will lead Oregon to decide by law that Health Care Is A Human Right, as most of the developed world has done decades ago. Help nourish the grass roots movement for a truly effective health care system for Oregon and the nation. What: Workshop for all who speak or wish to speak on behalf of health care for all. Objectives: Participants increase their understanding of the need for a unified health care system, learn to select and use appropriate materials for persuasive conversation and public presentations in a variety of settings and venues, and learn to cope with difficult questions with poise, confidence and accurate information. As a physician, I find it very odd that the debate about health reform has focused on the effect the law will have on the presidential election rather than its effect on patients, health professionals and health outcomes. The Supreme Court review reinvigorated the healthcare debate, but we hear partisan talking points rather than an honest review of the law. This will likely worsen as we get closer to Election Day. Health Care for All Oregon welcomes the survival of important patient protections and rights under today’s Supreme Court decision on the Affordable Care Act. These protections include the ban on refusal of coverage for pre-existing conditions, the required full coverage of limited basic primary care, and the extension of coverage of adult children under parental insurance through age 25. These elements move the human right to health care in the U.S. forward. A strength of the ACA was the effort to guarantee access to health care through Medicaid to the lowest-income workers not already eligible. That guarantee has now been turned into a struggle to be fought state-by-state. This deplorable blow to low income working families weakens the extension of the principle of social insurance in health care. It reinforces the need for a system that truly secures the human right to health care for everyone. The ACA remains inadequate. The Act categorically excludes millions of undocumented persons and will leave over 25 million persons in the U.S. uninsured. The system of private insurance continues to collapse, imposing on families a rising requirement to pay more for less. The rapid spread of high deductibles and high co-pays will lead to continued self-rationing, expensive delayed care, and continued widespread medical bankruptcy. The ACA creates no effective mechanism for shifting care priorities to health promotion, primary care and prevention, nor for reforming perverse incentives in provider compensation. It perpetuates massive avoidable administrative waste and fragmentation of the system. Meanwhile, Medicaid, Medicare and the ACA itself remain under political attack. Ultimately, the ACA fails to resolve the health care access and costs crises. It does not secure the human right to health care, which can only be guaranteed through a massive social movement. While welcoming the survival of patient rights and expanded access under the Affordable Care Act, Health Care for All Oregon continues to advocate for a truly universal publicly funded system that guarantees the fundamental right to health care to everyone living in the United States. Everybody In, Nobody Out! With health care premiums rising three times faster than workers’ income, more and more unions have come to see the existing health care system as unsustainable, despite their best efforts at the bargaining table. Learn more about the single payer movement. Read the conference speakers' bios. Join our mailing list, come to the Rally, be involved! Send us an email - we're here to help!